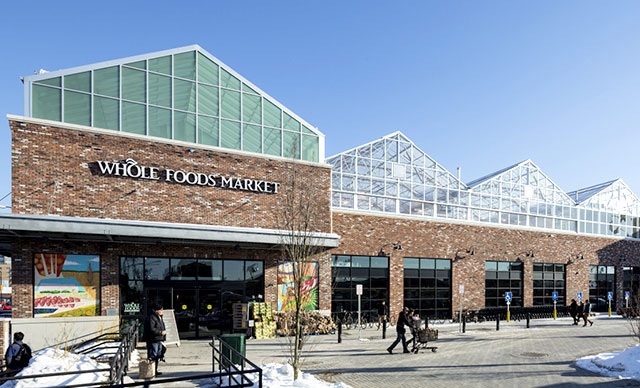 Whole Foods Market Brooklyn has partnered with Gotham Greens on the nation's first commercial scale greenhouse farm integrated within a retail grocery space. Gotham Greens grows premium quality, pesticide-free produce year round in the 20,000 square foot greenhouse at Whole Foods Market Brooklyn for Whole Foods Market locations throughout New York City. The specially designed rooftop farm includes advanced irrigation systems that use up to 20 times less water than conventional farming as well as enhanced glazing materials and electrical equipment to reduce overall energy demand. Based on the farm’s proximity to Whole Foods Market stores in New York City, the project eliminates long distance food transport and its associated emissions, while ensuring product freshness, quality and nutrition for thousands of customers in the area. Gotham Greens is a New York City based agribusiness that builds and operates commercial scale greenhouse facilities in urban areas for fresh vegetable production. Since commencing production in early 2011, Gotham Greens has quickly become one of New York State’s leading producers of premium-quality, greenhouse-grown vegetables and herbs. Gotham Greens’ pesticide-free produce is currently grown in technologically-sophisticated, climate-controlled rooftop greenhouses in Brooklyn, NY. Gotham Greens provides its retail, restaurant, and institutional customers with reliable, year-round supply of premium-quality produce grown under the highest standards of food safety and environmental sustainability.